Okay, I am going to stay on top of blogging my sessions now. 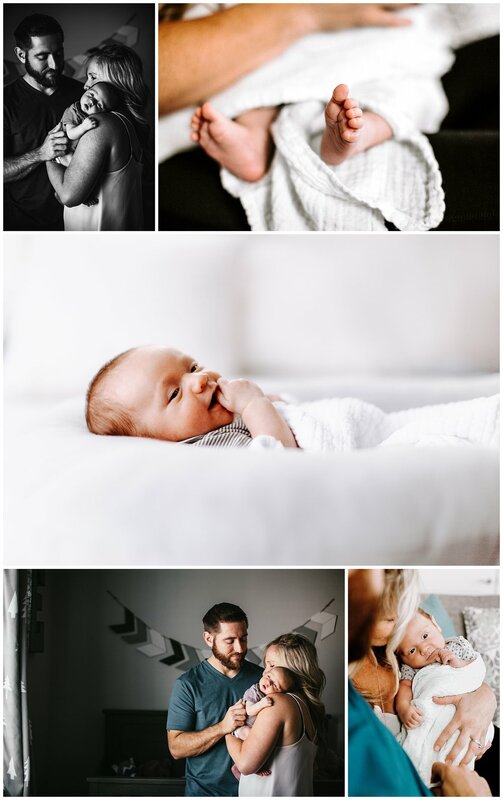 I am going to speak/write it into existence and it will happen- starting with this recent newborn lifestyle photography session here in Spokane, Wa with the sweet baby Enzo and his awesome, crossfittin' mama and dada. He's already got his own little shoes to wear to the gym even. Just over a month ago this little family was a very pregnant Erin, Branden, and Cali- aka Caligirl- their sweet, sweet pup (pictured below with Enzo). If you are friends with Erin, or even just acquaintances like we were, you knew how special Cali is and was to her. She cared so much for her furry sidekick and there was no question about that. Fast forward to Enzo being born and they became a little family of four. A few days before our session, when Enzo was just a little over 4 weeks old, I heard of the passing of Caligirl. I had to come up with a way to still be able to include Cali in this session, as her sticking it out until baby Enzo arrived was such a rite of passage for his welcome to the world and into their family. That transition from being a couple to being a family is so special. Side note, I'm glad I am 37 weeks pregnant already because these sessions give me baby fever! There will be plenty more indoor and in-home sessions happening after fall when we move into winter. Winters here are pretty brutal in Spokane, Washington (I'm kind of a wimp after living in San Diego, Texas, and Florida- even Seattle- the west side of the state is much milder than here.) Looking forward to many more like this to come! If you are interested in an in-home lifestyle session they can be be family sessions and couples sessions, not just newborns! They're all about capturing you in your environment, as that is a piece of the story you may want to remember.